A 15-minute stroll from the shores of the famous loch sits the Innkeeper’s Lodge Loch Lomond. It has existed as Balloch House Hotel for over a hundred years and couples rustic charm with modern en suite accommodation. The Innkeeper’s Lodge Loch Lomond serves hearty meals in the Balloch House pub, which has fireplaces and a beamed ceiling. Continental buffet breakfasts are served each morning. 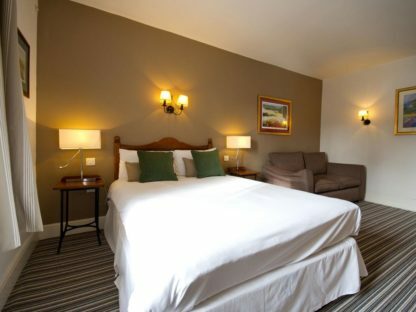 Each bright and neutrally decorated room comes with a TV and tea/coffee making facilities, some even with views over the loch or the River Leven. 7 local golf courses, 2 of which situated right on the loch, mean fanatics are spoilt for choice. Hiking in the Lomond and Trossachs National Park is on the doorstep, and the Balloch Castle Country Park is less than a 5-minute walk away. Glasgow city centre is 30 minutes away by car and Edinburgh Airport lies just over an hour’s drive.